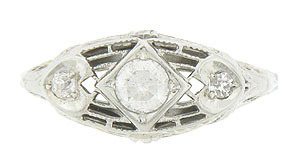 This splendid Art Deco engagement ring is set with .21 carat total weight of round faceted diamonds. 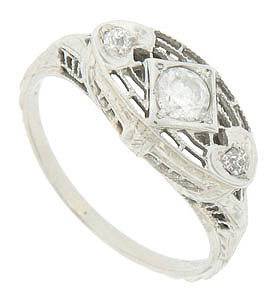 The oval raised face of the antique wedding ring is covered in a delicate web-like filigree which surrounds a central diamond shape. Hearts set with diamonds press into the elongated face on either side of the central figure. 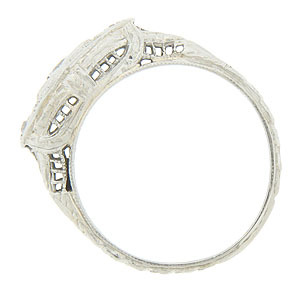 The shoulders and edges of the ring are also decorated in filigree and organic engraving. The ring measures 6.93 mm in width. Circa: 1920. Size 5 3/4. We can re-size.